Should you be filtering water on the trail? We recently discussed carrying water on the trail in relation to how much water to carry and how to carry it, however this is only half of the equation. In many places we hike, at least in western countries, we take for granted we will have access to good quality supplies of clean water right? While the answer is usually yes this is not a guarantee and what we see is not necessarily all that we get. While the water we are just about to drink may appear clean and clear what do we know about the upstream feeder sources? Are there farms or heavy industry? Has the local sewerage treatment plant upstream had problems that have resulted in a release of untreated effluent? What else is going into the water catchment system of the tank you are about to drink from? I can remember camping as a child and one of the water tanks we regularly used had a possum fall into it and drown. After a few days it was very, very obvious from the smell that something was seriously wrong with the water but for the first day or so this dead decaying possum was slowly dissolving into the water supply without us being aware, and with it all sorts of germs that I don’t want to think about! With so many different options available is one better than the other? Which one should you use? Each type of water filtration method has its advantages and disadvantages, and as such there really is no one perfect option for water filtration. You may even find that you use different kinds for different hikes. Lets have a look at the choices and see how they stack up. These purifiers excel at killing viruses along with other types of pathogens unlike most other choices on the market. They operate by ‘frying’ the viruses so they can’t reproduce. 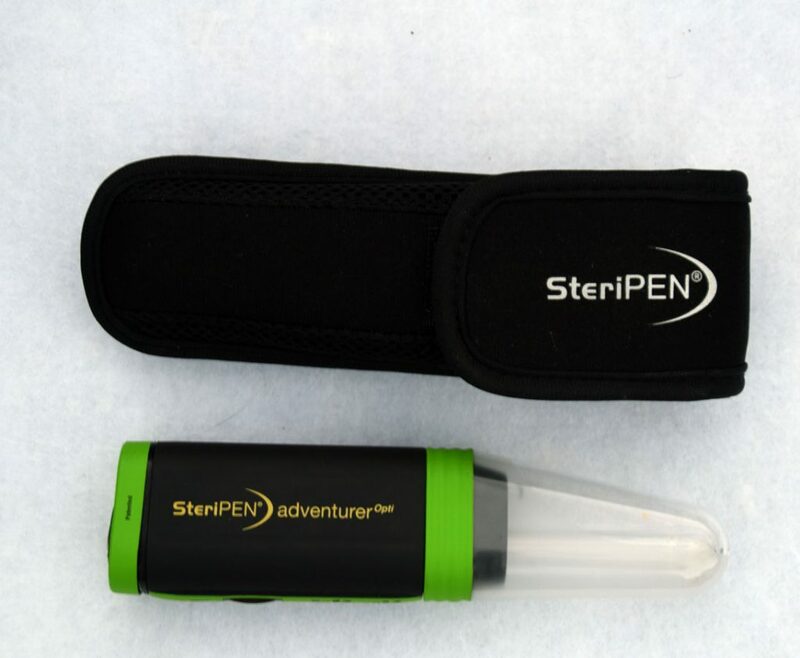 The SteriPEN, which is really the only supplier in this category for hiking purposes has been around for a number of years and produces a number of different models. 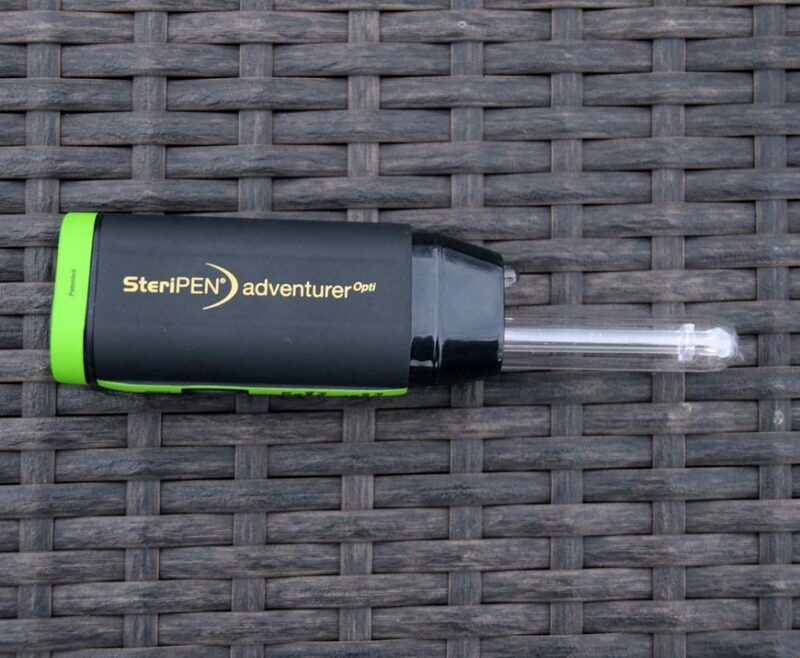 Most hikers who have been using these for a while will be familiar with battery operated models but there is now a rechargeable option as well. Essentially you just dip the UV component of the pen into your water bottle (doesn’t work with bladders), wait until the warning light goes off, and hey presto, your water is treated. I must admit I tend to be a sceptic with my SteriPEN so will always double treat the water just out of paranoia (did I mention that I never want Giardia ever again?). There are a number of different gravity filters on the market produced by companies such as Platypus, Sawyer and MSR. As the name suggests, these filters work by gravity. 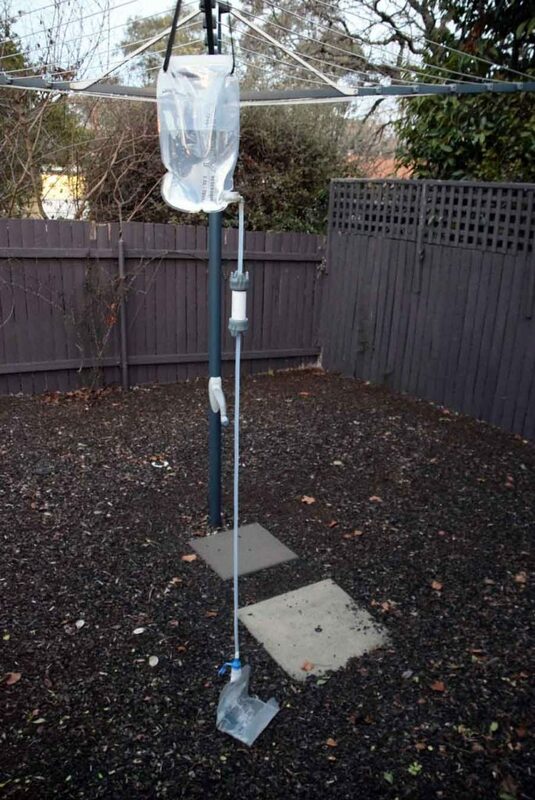 They are simple to operate – just hang the ‘dirty’ water bag up high either in a tree or on a rock, or hold it up if there is no other choice and let gravity do all the work. The bags are clearly marked as ‘clean’ and dirty so that you don’t confuse which one is the mucky water. 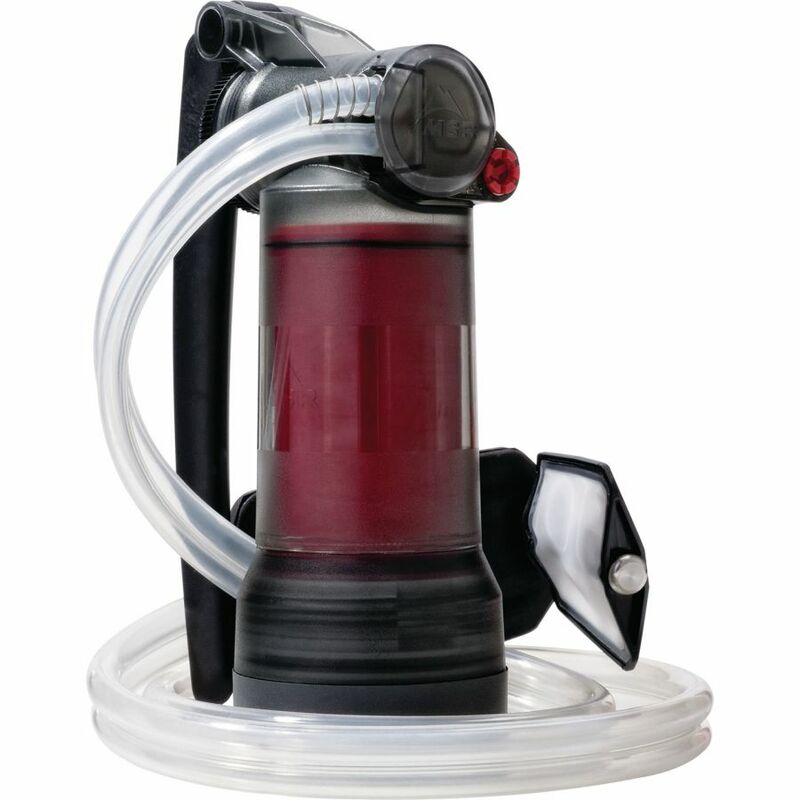 The Platypus Gravity Works is one of the best known options available in this category and comes in either a two or four litre capacity. The two litre system will take just under two minutes to filter (depending on the water quality). This is a great unit that will work well for solo hikers, couples, as well as for larger groups. These are the big boys, literally, of the water treatment world, and have been around for many years in one form or another. 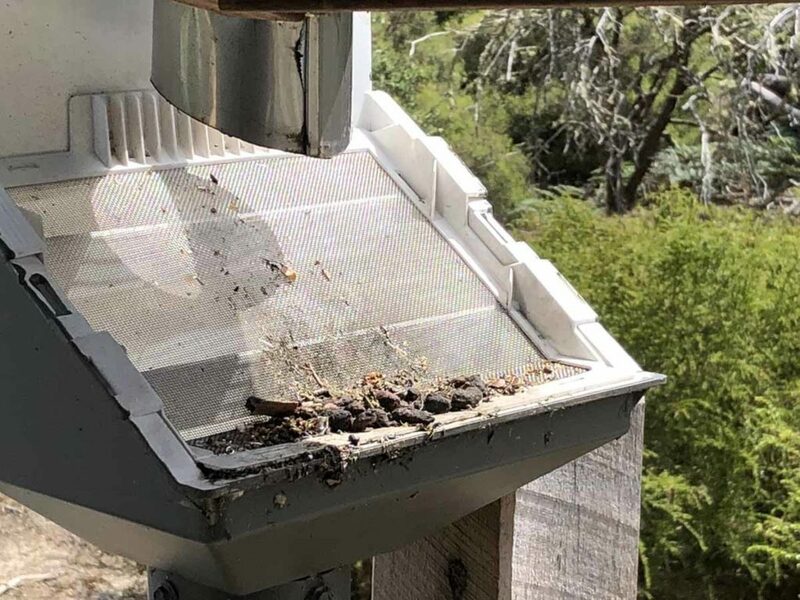 As named the filters physically pump water through a filtration system that will physically trap most waterborne nasties. They rely on your muscle action so you get a good workout at the same time as you filter your water. These filters are great for larger groups but can be a bit of overkill otherwise. Enter the MSR TrailShot; this compact smaller version is a stripped back version of its bigger brothers and is great for the solo hiker. 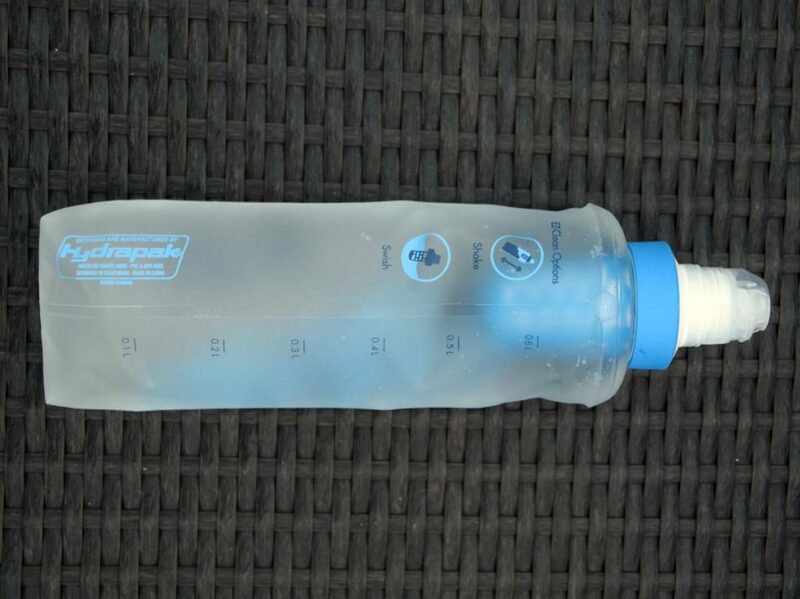 A relatively new entry into this category is the MSR Guardian Water Purifier which also filters viruses. This is probably the filter of choice when trekking through Asia or South America where viruses are likely to be present. Having said that is probably the dearest water filter on the market but given what it does, what value do you place on your health? 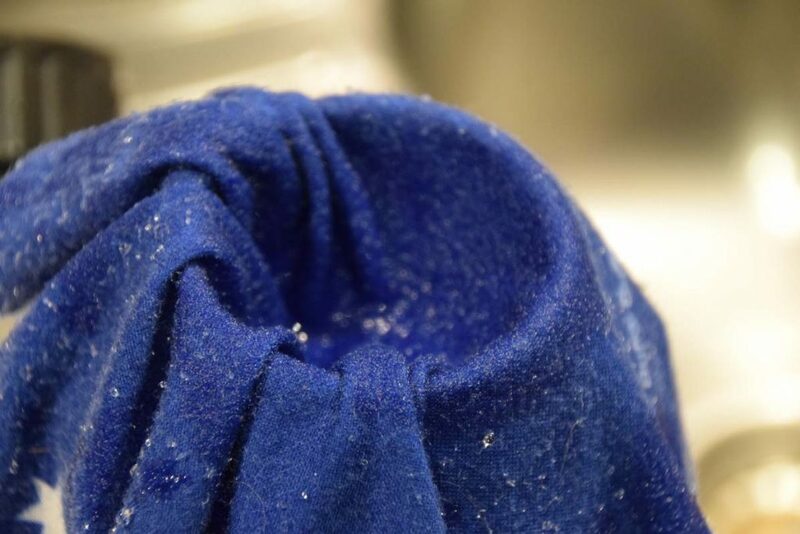 Using chemicals to treat water is by far the lightest option for the ultralight hiker but as always there are drawbacks. 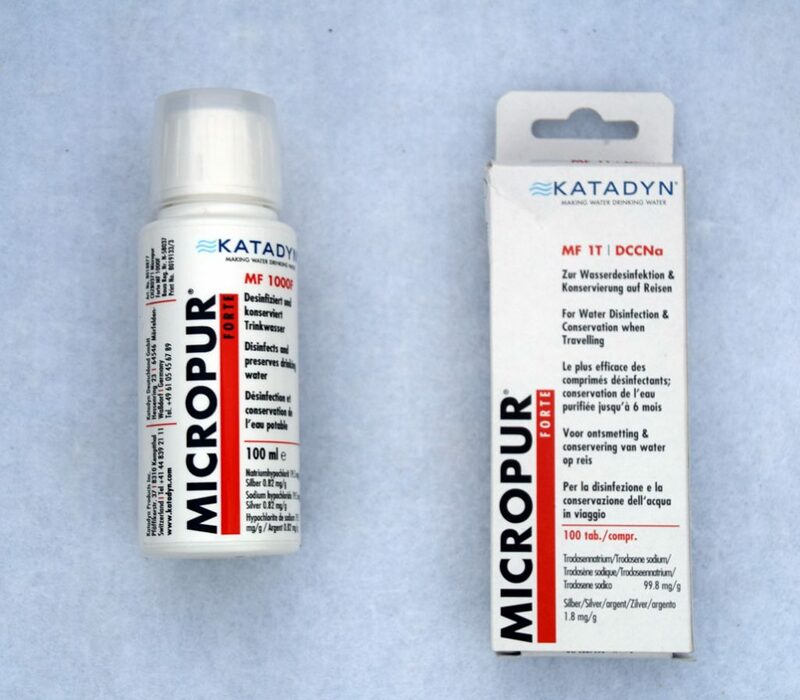 In this category you have choice of either tablets such as the Katadyn Micropur Forte or also from Katadyn, the Micopur Liquid Purifier. Other companies such as Aquamira are also well known but a bit harder to find. Both these options rely on treating water with a chemical agent. Again they don’t filter the chunky bits out of the water but they do provide drinkable water for up to a period of six months. The tablets are the easiest to use; just add one tablet per litre and wait of 30 minutes before drinking (for viruses and bacteria) or two hours for Giardia. As an example if you drink 4 litres of water per day the packet of 100 tablets will last 25 days. For people like me paranoid about Giardia, this means I would operate with at least two bladders and drink from one while the other is being treated. The liquid is a bit more fiddly requiring you to add 1 ml (1 drop) per litre. I prefer the tablets because you don’t have to measure. Do I really need to add chemicals to my drinking water? This is a bit of an odd category but ‘Personal Filters’ seemed to be the best label for the filters we haven’t yet discussed. This category includes the Lifestraw, the Katadyn BeFree and the Sawyer Mini Filter and while these can all be used to filter water for more than one person, most hikers who use these options have their own and they don’t share. The Lifestraw is very much a personal ownership type of object and is designed to drink water directly from the source through what can only be described as a large thick straw. This option works well in areas where there is water everywhere and you can pretty much stop and drink as much as you like when you want. It was originally designed for third world use to provide safe drinking water. Its not so good for those hikes where you have no water for 20+ kilometres and you need to carry water with you unless you feel like drinking through the Lifestraw out of a hydration bladder which is just awkward. The Katadyn BeFree is the next step on from the Lifestraw. You fill up a flexible 600 ml water bottle that comes with this unit and screw on the filtration unit as the cap. This option doesn’t involve you getting your face within a few inches of the water source like the Lifestraw but given it’s capacity, it also relies on frequent guaranteed sources of water. There are other brands that do similar things on the market but the flexible bag and the weight of this product makes for a great backup if you want one. The next model to discuss here is the Sawyer Mini filter. 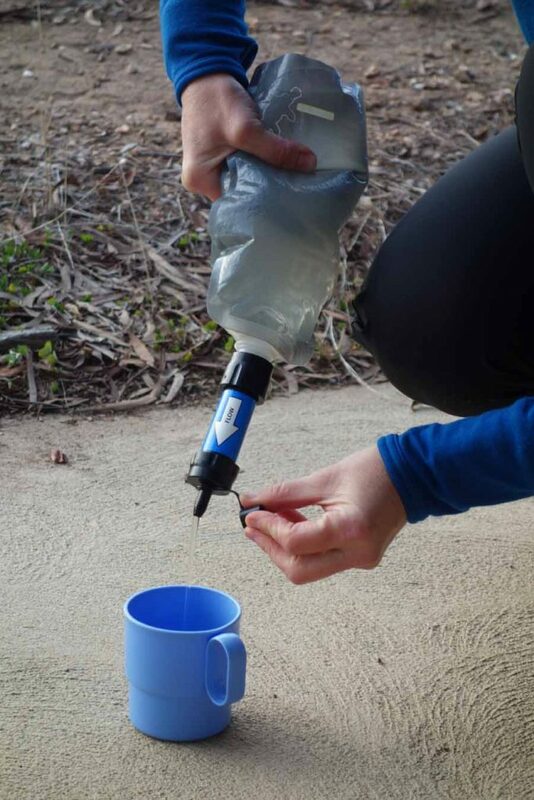 The Sawyer is a very versatile unit and comes with a straw that allows you to use it in the same way as the Lifestraw. 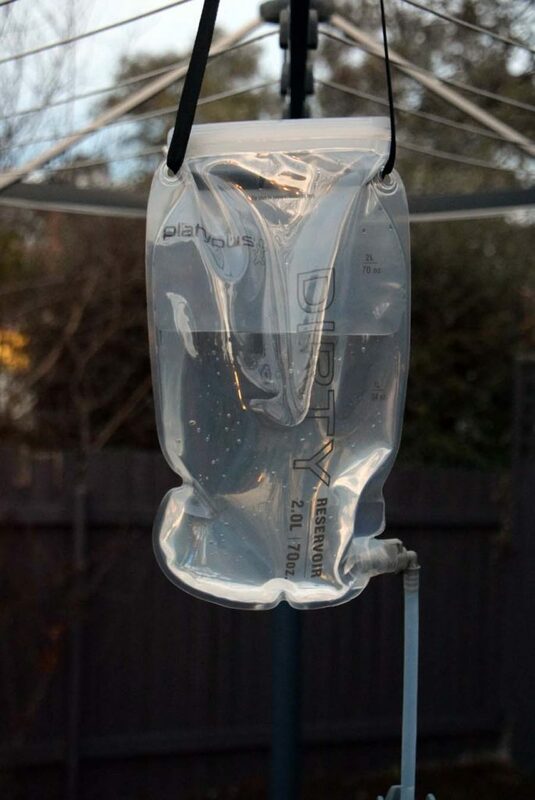 It also comes with a 500 ml flexible bag that you can squeeze water through either directly or into another water resivour such as a bottle or bladder. Care is needed here as the seal is not quite prefect so you want to ensure that any leakage doesn’t contaminate your clean water source or go straight into your mouth defeating the purpose of having a filter in the first place. 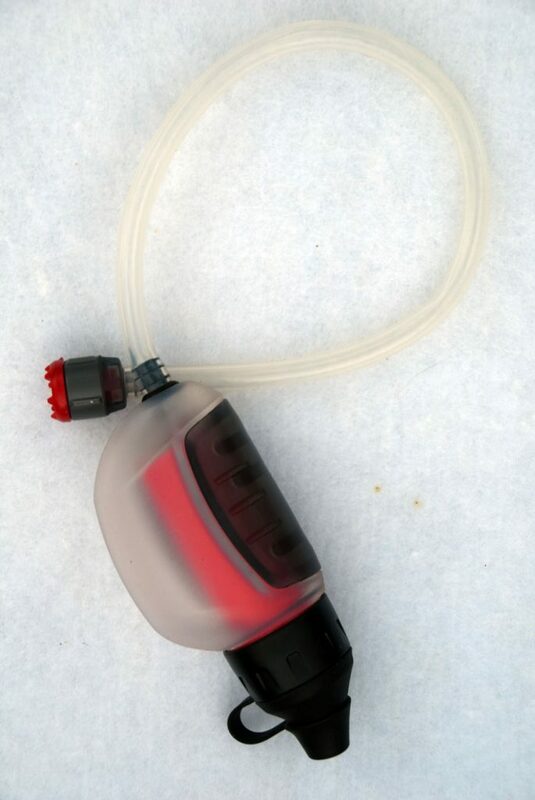 For me the Sawyer Mini is my current ultralight preference and I have mine inline with my water bladder which means that I top up my bladder and drink straight from the drinking tube. 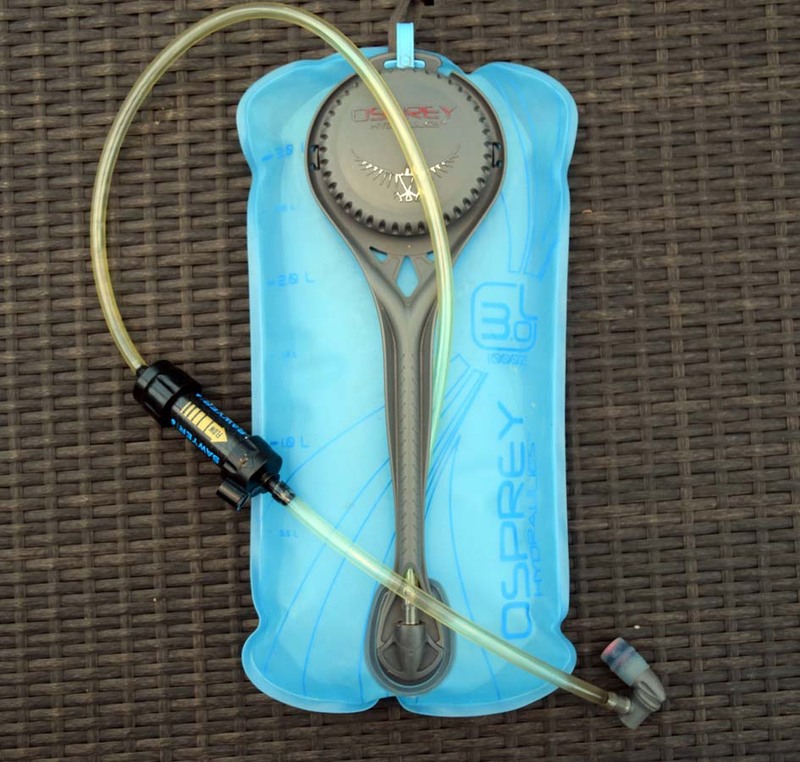 Putting this unit inline does make drawing water from the bladder a bit harder, particular when you have filled it first thing in the morning but it is very easy to use. Its no use using a filtration system if you just end up pouring contaminated water into the clean water receptacle. Even water on the rim of bottles can be an issue when you are drinking straight from the container. Just remember to fill the container slowly, ensuring you don’t allow contaminated water to enter the clean water vessel. Wipe the thread if you need. Another option to make your water safe is to boil it. Bring your water to a rolling boil for at least one minute to kill pathogens. This works well at the end of the day but if you are drinking 8 litres per day you will be spending a lot of time getting your stove out to treat your water. At altitudes over 2000 metres, boil the water for three minutes. What all this amounts to is that there is no perfect solution for filtering water. The best option really depends on the situation and your own personal preferences. There is no wrong answer here but make sure you have put some thought into why you use what you use. Base your decisions on water quality (are there viruses? ), types of water sources (natural or tank water), cost, weight, ease of use and last but not least the risks in drinking untreated water.